Enjoy living in beautiful Stagecoach with this move-in condition single family home in Meadowgreen with garage and plenty of storage. Nicely remodeled with reclaimed hardwood floors in the living room and a huge covered outdoor deck with custom ironwork railings for entertaining and enjoying the outdoors. New entryway/mud room has built-in storage for the entire family. Landscaped half-acre lot features a built-in firepit and trees and shrubs with drip irrigation. Energy efficient wood stove in the living area and public water and sewer keeps utilites low. 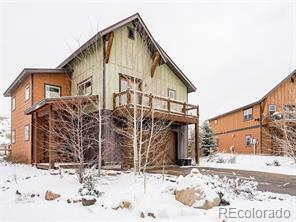 This well-cared for home would make an excellent primary or second home because it is close to the lake and an easy drive to Steamboat on all paved roads. Definitely put this one on your list to see!